In late November 1939, shortly after the start of World War II, the nomi­nally neu­tral but fas­cist govern­ment of Gen­er­a­lis­simo Fran­cis­co Franco rati­fied a pact with Ger­many in which Spain pro­mised “more than favor­able” neu­trality. On this date in 1940 in Hen­daye, a town on the Franco-Span­ish border, Adolf Hitler pressed the Span­ish leader to join the Axis camp, con­sisting then of Ger­many and Italy. Hitler’s meeting with Franco and the next day with Vichy France head Marshal Philippe Pétain was to solidly secure the west­ern part of Europe for the Axis before em­barking on his cru­sade against the Soviet Union (Opera­tion Bar­ba­rossa) in mid-1941. In return, Hitler offered to assist Span­ish forces in driving the British out of their Gibral­tar for­tress on the south­ern tip of the Ibe­rian Penin­sula (en­trance to the Medi­ter­ra­nean), even setting a date for the deed: Janu­ary 10, 1941. The impli­ca­tion was that Spain would then part­ner with Ger­many and Italy in their war against Great Britain. The wily Franco rejected direct Ger­man assis­tance in seizing the Brit­ish strong­hold. Span­ish pride required that Span­ish troops carry out the his­toric mis­sion, he told Hitler. What he wanted as com­pen­sa­tion for Spain entering the war on the side of the Axis was equip­ment, money, and food­stuffs to alle­vi­ate the effects of the Span­ish Civil War (1936–1939). To top it off, he demanded border changes with France and prac­ti­cally all the French colonies in North Africa, in­cluding Al­geria and Moroc­co. Acceding to Franco’s demands would have harmed Ger­many’s rela­tions with Vichy France, which had con­cluded an armis­tice with Ger­many four months earlier. Ger­man foreign minis­ter Joachim von Rib­ben­trop called Franco a “cowardly in­grate” in light of Axis assis­tance to Franco in the civil war. In a letter to Franco, dated Febru­ary 6, 1941, Hitler wrote that Ital­ian dicta­tor Benito Musso­lini, Franco, and he him­self were linked to one an­other by the most im­plac­able force of his­tory. Hitler’s flat­tery failed to nudge Franco, who none­the­less assured Hitler of his loyal­ty and stressed his sol­i­dar­ity with the Axis short of mili­tary en­gage­ment. To Mus­so­lini, Hitler pre­dicted that Franco’s re­buff would be the big­gest mis­take in the Span­iard’s life. Actually, it wasn’t. Of all the Euro­pean dicta­tors who sided with Hitler and Musso­lini, Franco was the only one not to share their fate—dying peace­fully in his bed in 1975 after almost four decades in power. Left: On October 23, 1940, Hitler’s special train rolled into Hendaye, a French town that borders Spain in the Pyrenees. There he was warmly greeted by a suspicious Francisco Franco (1892–1975), who ruled over Spain from 1939 until his death on Novem­ber 20, 1975. According to Franco’s daugh­ter, her father was worried about the Ger­mans pos­sibly kid­napping him and forcing him to take Spain into the war on the Axis side. 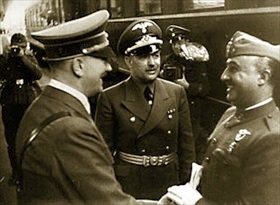 Right: Franco had arranged an extremely fes­tive recep­tion and honor guard for his meeting with Hitler. Hitler imme­di­ately got down to busi­ness. He explained that he looking for allies in his war against Great Brit­ain. Naturally there must be a quid pro quo, said Franco, who needed money to rebuild roads and railway lines destroyed during the Span­ish Civil War, food­stuffs, and mili­tary equip­ment to rebuild his army among other needs. Plus, he was inter­ested in acquiring impor­tant French holdings in North Africa to add to his own modest holdings there. Left: There was no meeting of the minds inside Hitler’s Son­der­zug (private rail­way car) where the two leaders spent seven-plus hours in fruit­less discus­sions. 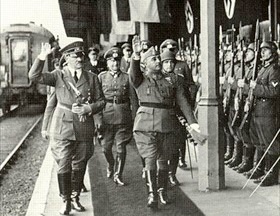 Hitler told Franco that his trip had been use­less in light of Franco’s reluc­tance to enter the war on the Axis side. Though Franco claimed his coun­try was a neu­tral state, in August 1941 he sent some 45,000 volun­teers (the “Blue Divi­sion,” or Divi­sión Azul) to fight along­side the Ger­mans on the Soviet front. Franco also opened his ports to Ger­man sub­ma­rines and invaded the inter­na­tionally admin­istered city of Tangier in Morocco after the fall of France in 1940. 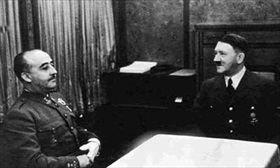 Right: Upset with the results of his meeting with Franco (Hitler fumed to Field Marshal Wil­helm Kei­tel: “I’d rather have three of my teeth pulled than have another meeting like this one”), Hitler hoped to fare better with the 84‑year-old Vichy Head of State Marshal Philippe Pétain when the two met in Mon­toire, France, on Octo­ber 24, 1940. A polite duel ensured between Hitler and Pétain, who wanted to know what fruits France would harvest by collab­o­rating with Ger­many: Ger­many still held more than two mil­lion French POWs and there was the issue of France incurring huge costs in main­taining the Ger­man occu­pa­tion army on French soil, etc., etc. Hitler managed, how­ever, to per­suade the French Marshal to put in writing France’s sup­port, “within the limits of its ability,” for mea­sures the Axis powers took to defeat and occupy England.